A horse named Nugget – Wisdom from a horse. I spent a rainy afternoon walking the fields of a friend and client meeting her herd of horses. I had come that day to spend some time in person with her supporting her in stepping more fully into her own medicine. There was a beautiful palomino named Nugget who demanded attention. When I walked up to this horse, I could immediately feel a kingliness about himself. I could feel how this horse considered himself royalty. While standing with him, I could see a vision of him adorned in beautiful bridles with jewels and gold. "King Nugget," I shared this with my friend and she laughed, "That is Nugget." 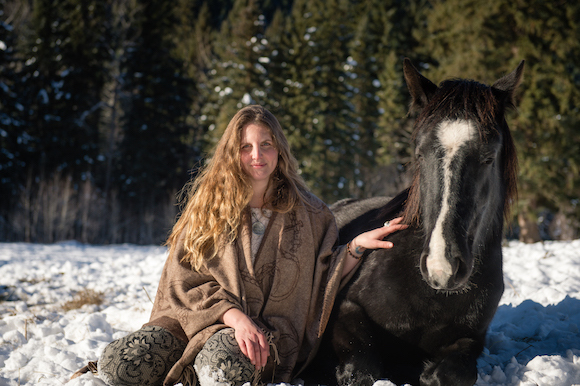 Whenever I meet a horse or even spend time with one of my own, I am always curious as to what mirror or reflection and awareness this horse is bringing me. Even with my own herd of 17, I am always curious. Today it was Nugget with his absolute ownership and confidence of his presence, his place and of the lineage of who he was. It is not often we give ourselves permission to gloat, or to speak of our own glory. It is not often we are unapologetic in wearing so boldly, and with authority, our own magnificence. But in this stunning piece of land, amid the rain and small herd, this horse exuded it. So I was curious, both for myself, and for my client, where are we holding back? We are rarely comfortable stepping into our fullness, seeing it for ourselves and declaring it with the world. We can be afraid of coming off as boastful or arrogant, so we hide, or shy away, or we stay in our humility. There is something beautiful about us claiming our own brilliance, of owning our glory and our gifts. It is a powerful thing to behold and to be inspired by when we hold our own greatness. In my own journey I have seen the transformation and the impact in my own world as I got comfortable or pushed the edges of my comfort of shining fully in my own light. And as I stood with this horse, I was curious... Are there places I am still holding back? Are there places you are still holding back? What if we were not afraid to own who we were? To dress the way we wished to dress, even if it meant wearing a crown adorned with glitter and jewels? What if we were not afraid to speak our truths, to acknowledge our greatness, to see ourselves holding court with those we were inspired by? What if we stopped hiding thinking we were being humble and instead owned the glory of our brilliance? What if we shined and then pushed ourselves to shine brighter? When I came home to my own herd later in the afternoon, I took a walk out to my herd and was followed by one of my youngsters, Indy. Indy is another horse that exudes confidence. She will one day be lead mare of the herd. She knows that, doesn’t doubt it and owns it. She is fearless in her being. As I was open to her own wanting to follow me around, I listened to what she was bringing me. Be bolder, look deeper, don’t lie to yourself about who you are and what you bring to the world. So even if I think I have come a long way, I was reminded today that perhaps there is more to come. Thoughts, dreams and visions I have about the type of leadership I wish to bring into the world, where I hope to contribute with my purpose, the company I would love to stand alongside of. And in my heart today I also noticed a fear and doubt that said, don’t be too greedy, don’t be too ambitious, or egotistical and I deflected those deeper desires. And these two horses put me in my place. "Stop doing that," they said. "Follow that inner calling to occupy and see more of your brilliance and be that in the world." So as I reflect on this today, as I begin to step into the visions that speak to me, I give permission to unfurling my wings a little more wider, of shining my light a little brighter, of going for things even though I think it might be judged as too much and own the part of me that knows better is saying. Time to shine brighter, fellow reader. What Is Resistance Really About?